The economic indicators for the next 6 to 8 months are turning even stronger. But real M2 . . . .
Politico is reporting that they have a draft document of the Republican health care plan. The details are laughable. Let's review the "three-legged stool" that is the ACA. To cover people with pre-existing conditions, we needed to expand the pool of insureds. This led to the individual mandate. And to help people buy insurance, the government provided subsidies. How do the Republicans deal with this? Subsidies are the only reason why a majority of the current insureds can buy insurance. Without them, most people will be driven from the market. For example, in the program's second year, 90% of the participants qualified for some type of subsidy. The $2000 tax credit will only pay far -- at most -- a few months of coverage. Removing the subsidies means people will have to pay for insurance entirely out of pocket -- which most current participants can't do. So, they're gone from the market. And if people can't buy insurance, they have to pay a 30% penalty when they re-up their coverage. This penalty will guarantee that those who couldn't buy coverage before most certainly won't buy coverage again. And high-risk pools -- an idea that has bever worked -- are back. You have to give Ed Morrissey and Jazz Shaw of Hot Air some credit; despite a multiple year run of being completely wrong about all things economic and financial, they each continue to believe they have sufficient analytical capabilities to inform their readers on those topics. By now, most people would realize that they have no business writing stories in either discipline. But neither Shaw nor Morrissey have the requisite amount of self-awareness to make such an observation. For those of you paying attention, you'll notice that revenue continues to increase Y/Y. For Mr. Shaw, I would simply point out that this is exactly what companies are supposed to do. This ended today's lesson for Mr. Shaw. Please realize that you have no idea what you're doing when it comes to economics and finance. Over the last few months, new home sales have diverged significantly from housing permits and starts. It's possible that the recent higher mortgage rates have shown up already in sales, but not yet in permits or starts. My updated look at housing sales, prices, and inventory is up at XE.com. Do healthier longevity and better disability benefits explain the long term decline in labor force participation? A few weeks ago I took another deep dive into the Labor Force Participation Rate. There are a few loose ends I wanted to clean up (at least partially). Once we add +0.3% to the YoY change, the LFPR always stays very close to 100. But what is the *reason* for this very steady decline that has already lasted a lifetime. 2. (a) better health care, leading to (b) an increased life span. 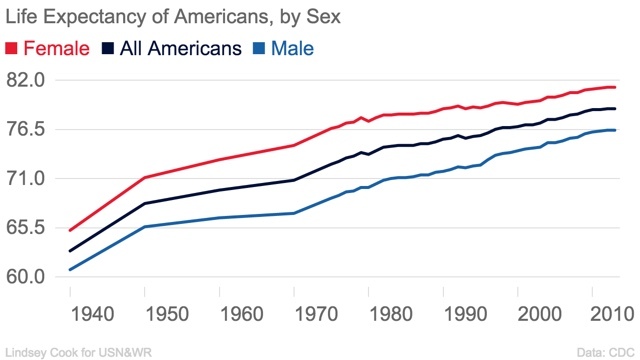 Here's the thesis: 60 years ago, men (whose life expectancy from age 20 was only to about 67 years old to begin with) went from abled to disabled to dead over a shorter period of time. Now at age 20 they can expect to live to about age 76, and if they get disabled, better health care will keep them alive for a much longer period of time. And more conditions can qualify them for disability. This means that a greater percentage of men qualify for disability, and once on it, they survive beyond working age. (Note that if somebody dies at say age 50 while on disability, they - ahem - are no longer part of the population). That hypothesis would explain the long term and relentless decline in the LFPR for men. Following the recession, the number of men on disability who left the labor force declined almost trivially compared with the number of men not on disability who left the labor force. 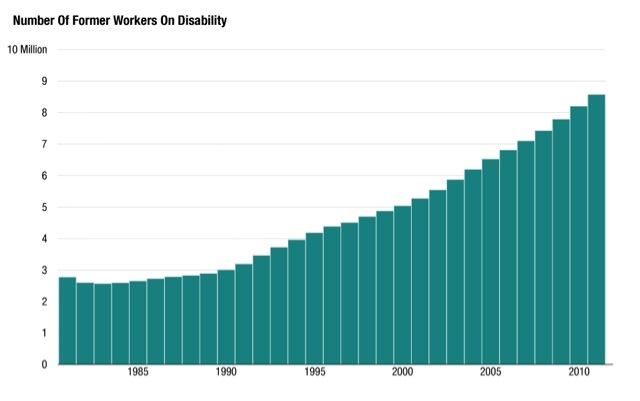 Those on disability bottomed first (2010-11) compared with the able-bodied (2011-12), and surpassed its 2008 level by 2015, whereas able bodied men not in the labor force just pulled even with their 2008 level in 2016. Obviously more work needs to be done to flesh out this hypothesis, but I think it is a good fit for the data. Profs. Brad DeLong and Jared Bernstein continue to dispute whether the loss of American factory jobs is primarily a matter of efficiency or primarily a matter of offshoring. .... Globalization's big effect has been to enable the construction of intercontinental value chains and to create a much finer global division of labor. It has greatly weakened the bargaining power of unskilled manufacturing workers here in the United States, yes. But has it done the same to semi-skilled and skilled manufacturing workers? ....Unskilled manufacturing jobs are not good jobs. Semi-skilled and skilled manufacturing jobs are. I think that odds are at least 50-50 that Larry [Summers] has gotten the sign of the effects of globalization on bargaining power wrong for those manufacturing jobs that are worth keeping. More simply put: there are lots of Chinese and other asian robots that are much more efficient than American robots. Otherwise why would you need a robot-factory supplier half the way around the world as opposed to the robot-factory around the corner? 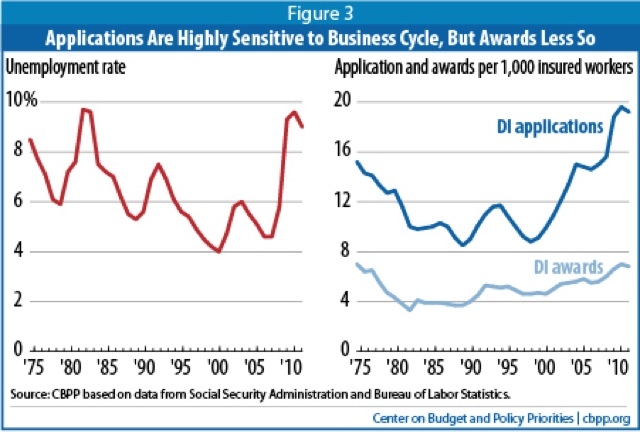 The data do not support the claim that there’s been an acceleration in labor-replacing technology displacing US workers. To the contrary, measures of capital investment and especially and most persuasively, productivity growth, have slowed, trends that point in the opposite direction..... . . . If automation were increasingly displacing workers, we’d be seeing more output produced in fewer labor hours, aka, faster productivity growth. But we see the opposite. Put another way, if DeLong is correct, and American workers have simply been replaced by American robots, then factories have been made more efficient and thus producers' supply curves should have shifted to the right (I.e., they are willing to produce the same or more at lower cost). Thus they should be supplying more per capita to consumers. After great strides in the 1990s, except for one year or so, industrial production has declined. Eight years after the end of the Great Recession, manufacturing production per capita (red in the graph above) in particular is still down more than 10% from its peak. There is simply no getting around that production has left America. Are foreign*robots* also cheaper?!? 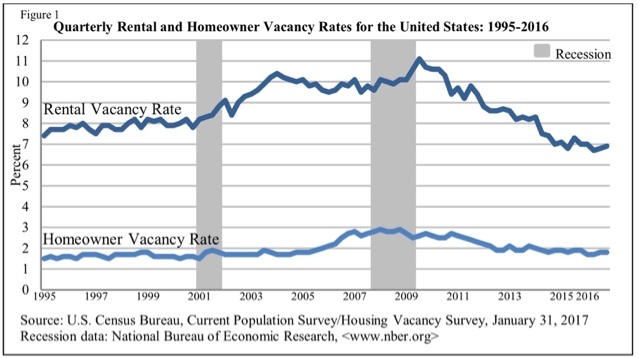 Wages and household income vs. housing: which leads which? Sometimes I look into a relationship that doesn't quite pan out, but it's still useful to flesh out the process. That's the story of real wage growth vs. housing. In the last few months I 've pointed out that real wage growth has been slowing. In January, it went negative YoY. Since, all else being equal, having less money to save for a downpayment, or to pay the montly mortgage ought to lead to fewer new housees being built, So has that been the case historically? 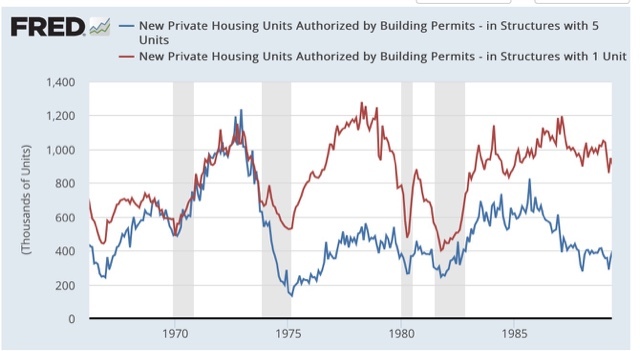 Since the series started in the 1960s through the mid 1980s, permits appear to have led real wages. But since the mid-1980s, the relationship if any is less clear, with coincident turns until 2001, and then if anything wages appearing to lead permits. 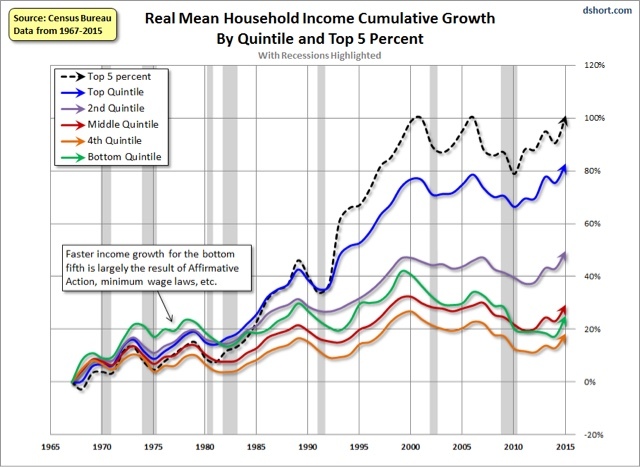 Again, if anything, permits seem to lead household income by about 2 years. The 1980s do not appear to correlate at all. Since 1990, there is a broad correaltion, but with income ahead of wages by a year or two. This at last does seem to give us a reasonably consistent relationship whereby the YoY change in real wages adjusted by partication either are coincident with or slightly lag housing, with the exception of ths housing bubble and bust. If this is true, then we should expect the recent slowdown in YoY growth in the housing market to give rise to a stagnation at least of participation as well as real wage growth. This is a serious real-world issue, and big increases in rent may have completely eaten up the savings from gas prices among lower-income Americans. 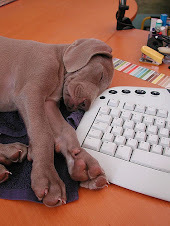 I have been tracking rental vacancies, construction, and rents ever since. The Q4 2016 report on vacancies and rents was released several weeks ago, so let's take an updated look. Rent increases continue to outpace overall inflation, while there is some evidence that they may have peaked as a share of wages. Median asking rent rose from $842 to $864 in the last quarter of 2016, but is only up $14 from $850 YoY, an increase of 1.6%. At the same time, he entire year of 2016 averaged a 5.3% increase from all of 2015. The increase has only been to the 400,000 level, and has been stuck in that neighborhood for going on 3 years. 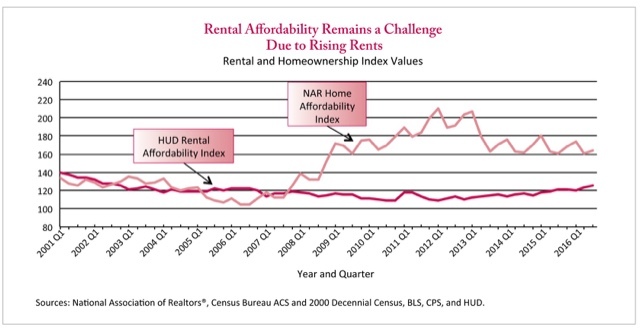 I expected the "apartment boom" to continue, with increased building of multi-family units. That didn't happen. Rent increases probably sucked up much of the windfall lower income consumers got from declining gas prices. Now that gas prices are increasing again, I expect the consumer to start showing signs of distress. I'm not sold on HUD's method, mainly because it relies upon annual data released with a lag. In other words, the entire last year plus is calculated via extrapolation. I suspect we could get much more timely estimates using Sentier's monthly median household income series, compared with the monthly rental index calculated by Zumper. 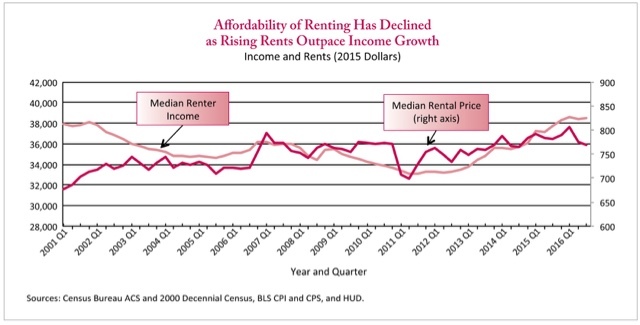 But regardless of which method we use, it certainly appears that apartment rents as a share of renter income are quite high -- but the crisis probably has abated at least a little.